Keeping a flock of sheep means becoming a good shepherd. There's a reason the term is used so often metaphorically -- it's a lot of work and responsibility. In addition to providing for their basic needs, you'll need to make arrangements for annual or semi-annual shearing, regular hoof trimming, vaccinations and deworming. You'll also need to protect this vulnerable species from predators. Choose the right breed for your purposes and region. You can raise sheep primarily for meat or wool, with some breeds suited for both purposes. If you're in the market for a wool breed, consider what type of wool best suits your needs. Medium-wool sheep, such as the Suffolk, produce fleece primarily for the larger commercial market. People interested in hand-spinning fibers prefer long-wooled breeds, like the Leicester. More expensive "fine" wool comes from breed such as the Merino. Heat is more of a problem than cold for sheep. If you live in a hot region, you'll need a breed that can deal with the climate, like the Navajo-Churro. Keep your flock on pasture most of the year. 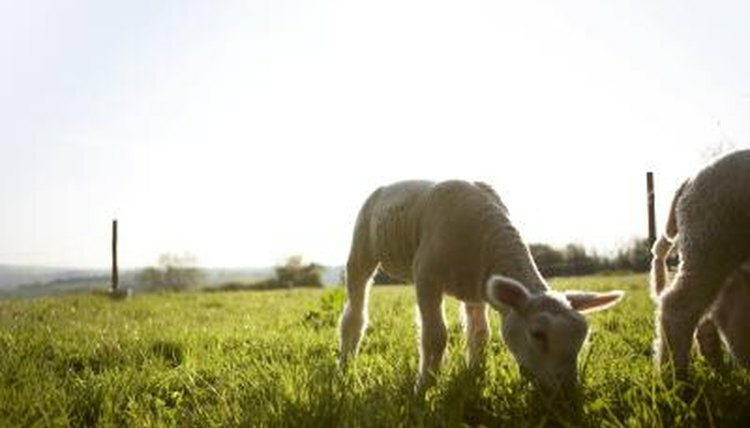 If you have good grass, you can keep five to ten sheep per acre. To prevent parasite infestation, besides deworming, you should alternate pastures rather than keep your flock in one field all the time. In addition to pasture, you'll need to provide your flock with a mineral block containing salt and necessary minerals. In winter, you'll need to feed hay. If raising sheep for meat, you might need to feed grain, as this improves the meat's flavor. It also adds to your flock-raising expenses. Pregnant and nursing ewes also need grain. Your flock must always have access to fresh, clean water. While sheep should have protection from the wind and elements, they don't usually require elaborate barns because their wool keeps them warm. A humid barn will end up causing respiratory issues, so go for colder, but dryer, housing. In all but the harshest climates, sheep can usually do well throughout the winter, but lambs are another story. If your ewes deliver in winter, the babies need protection. When keeping ewes indoors before and after lambing, approximately 15 square feet of space per animal is a good rule of thumb. Your best bet for fencing is electric wire, which keeps sheep in and predators out. The University of Wisconsin Extension recommends using at least five strands of wire, with spacings from the ground up of 6, 5, 5, 8 and 10 inches. You can also use woven wire fencing with electric fencing installed around the perimeter of the field, about 10 inches off the ground. If you've got sheep, you're likely to have predators. Sheep-killers can range from wolves and coyotes to the neighbor's dog. Even with good quality fencing, you can have losses. All it takes is one gap or break in the fence line or a shortage in the electric fence. Consider adding a donkey or llama to your flock. Both of these animals will chase off canines. Certain breeds of dogs will also guard sheep, after being raised with the flock since puppyhood. Some of these dogs even look like sheep, with soft, white fur. Breeds include the great Pyrenees, maremma and kuvasz. Ohio State University: Thinking of Raising Sheep?